at the Armidale Ex Servies Club. 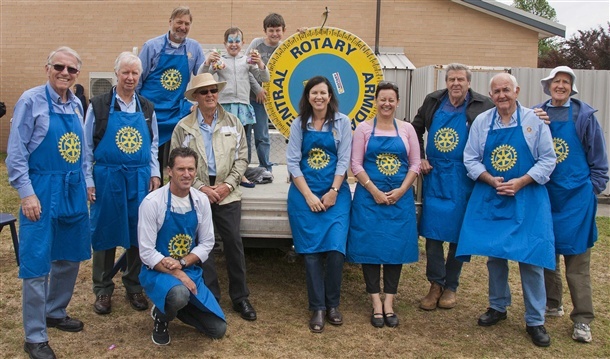 The Rotary Club of Armidale Central is involved in helping members of the local community in many ways through supporting several local projects and organisations. These currently include Autumn Lodge retirement home, the New England Conservatory of Music, Armidale and New England Hospital, and Anglicare. As with most Rotary Clubs, we work to help younger people through various international student exchanges, as well as by supporting local students who wish to attend courses in science, agriculture, leadership, and safe driving. In March 2015 we supported the formation of an Interact Club at Duval High School, Armidale. We run the annual Armidale Book Fair, and organise various social events, and enjoy good fellowship while working to help others. The Armidale Book Fair is a regular event on the New England calendar. Thousands of second hand books are available at very reasonable prices and all proceeds go to the charities, organisations and projects supported by our Club. The Book Fair is held in May each year. Thanks to all our wonderful supporters, volunteers, and the various organisations that helped us stage the May 2018 Book Fair and the December 2018 Book Sale. Now we're gearing up for the 2019 Armidale Book Fair. Saturday, 11th May to Saturday, 18th May 2019. Please put it in your diary now! You'll find our YELLOW BOOK BIN at the corner of Dumaresq and Canambe Streets, Armidale, just near our book shed (which is open from 7:30 to 9:00am on Monday and Friday in case you have a special load). Contact us if you can't deliver the books yourself - we may be able to arrange a pick up. See the sidebar on this page for our Secretary's email address and phone number. We look forward to working with you to ensure families receive the emergency aid they need following a disaster. 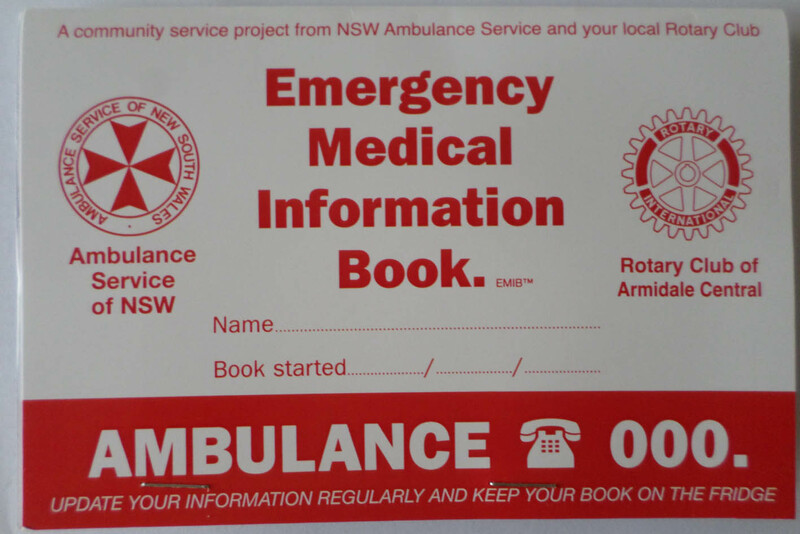 The Rotary Club of Armidale Central launched the Emergency Medical Information Booklet for Armidale in February 2015. The book is a small folding document that contains personal details, medical history and a list of medications. It slips into a plastic sleeve which has small fridge magnets on the back and then can be attached to the fridge. In case of an emergency the ambulance officers can very quickly establish the vital information and expedite treatment and transfer to hospital if required. This information could save your life in an emergency!! The books are available free of charge from pharmacies and all general practices in Armidale. A gold coin donation is encouraged so that our Club can continue to provide this service into the future. Read more about our EMIB Project.